What Is a Whip Mouthpiece? What Is a Stirring Tool? What Is the Cyclone Bowl? What Is the Tuff Bowl? What Is a Heater Cover? What Does Vaporizer Tubing Do? When to Replace a Vaporizer Balloon? The Arizer Mouthpiece is a replacement mouthpiece for the whip that comes with the Arizer Extreme Q and Arizer V-Tower desktop vaporizer. Crafted out of glass, the mouthpiece keeps vapor clean and is designed to fit comfortably in your mouth for a pleasing draw. The whip mouthpiece is used to draw vapor out of a desktop vaporizer. It connects to a length of tubing that is usually attached to a wand that contains the dry herbs, wax or oil that is being vaporized. The vape mouthpiece is the part that actually goes into your mouth. Who Needs a Whip Mouthpiece Replacement? Although glass is considered the best material for use in the design of whip mouthpieces, it is fragile and can break. The Arizer Mouthpiece is an exact replacement for the original mouthpiece and can be used to repair a whip. Additionally, if you plan to share your whip with someone else, it is a good idea to have a separate mouthpiece for each user. This helps to prevent the spread of germs. The Arizer Glass Stirring Tool is one of the most well made glass stir sticks on the market today. Although it is part of our Arizer parts collection, these stirring sticks can be used with any and all vaporizers. The long tapered shaft is ideally shaped to reach inside of wands, and the rounded top makes the tool simple to grip. The decorative effect at the top adds to the appeal of this accessory. A stir tool is an accessory that is included with many desktop and portable vaporizers. Stir sticks are primarily used to mix up blends during vaping. When you stir up your vaping materials every few draws, you can ensure that they become fully vaporized and decrease the risk of combustion. As a result, stirring sticks help to reduce wastage and are essential vape tools. You can also use a stirrer as a dabbing tool for waxy concentrates and to assist with cleaning. Glass stir sticks are preferred by many vape enthusiasts. Because glass does not conduct heat well, the handle end of the stir stick is not likely to become uncomfortably hot. In addition, natural glass is free of chemical impurities that can contaminate vapor, introduce toxins and take away from its taste. If you've lost or broken the connector or adapter that joins your whip to your Arizer Extreme Q Vaporizer and Arizer V-Tower Vaporizer, you can solve the problem with the Arizer Elbow Adaptor. This high quality Arizer part is a brand new original component made by the manufacturer and is identical to the standard parts included with the Arizer Extreme Q and Arizer V-Tower vape. The Arizer Elbow Adaptor is constructed out of heavy-duty borosilicate glass that ensures a contaminant-free vape and is resistant to breakage. A domed mesh screen is included for your convenience. This part is used with the Arizer Mini Whip. If you also need a replacement for the vape tubing that attaches to the collection bags, purchasing the Arizer Mini Whip Kit Set is an ideal solution. It includes the adapter, screen and 3 inches of food grade tubing. Part of what makes the Arizer Extreme Q and Arizer V-Tower vaporizers such remarkably efficient desktops is the Arizer Cyclone Bowl. This bowl is identical to the Arizer parts included with the initial purchase of both the Extreme Q and V-Tower desktop vapes. The Arizer Cyclone Bowl is the heart of the two popular Arizer desktop vaporizers and is where vaping material is placed to be warmed by the heating element. Constructed out of borosilicate glass, the bowl is free of contaminants to ensure excellent vapor quality. A screen disc is included with the bowl to improve the efficiency of the vaporizer part, and its vertical design allows for vapor to rise freely inside of the vaporizer for even heating. The black top is insulated to keep the bowl cool to the touch for easy handling. Who Needs the Arizer Cyclone Bowl? Although borosilicate glass is more durable than many other types of glass, it can still break if it is not handled properly. The Arizer Cyclone Bowl is one of the most fragile components of both the Arizer Extreme Q and Arizer V-Tower, and this replacement part can be used in the event of breakage. Some people even choose to purchase a spare bowl simply to have on hand in case of an accident, as the Extreme Q and V-Tower cannot operate without the bowl. Transform your Arizer Extreme Q or V Tower vaporizer into an aromatherapy diffuser with the Arizer Potpourri Dish. When filled with your favorite essential oils and used with your desktop vaporizer, the potpourri dish vaporizes the oil and releases its fragrance compounds into the air. The Arizer Potpourri Dish is a great solution for fighting unpleasant odors in any room of the home. By working with your vaporizer to release the scent of essential oil into the air, the potpourri dish can help to mask those odors in a way that is far more natural than spraying chemical-based air fresheners in your home. In addition to being used as an air freshener, the Arizer Potpourri Dish can double as aromatherapeutic device. Aromatherapy is a natural healing tradition that seeks to heal or alleviate the symptoms of physical and emotional health problems using the power of scent. Using a vaporizer for aromatherapy allows far more of the active scent compounds to escape into the air than other methods of diffusing, and it doesn't add carcinogen-laden smoke to the air the way that candles and incenses can. Be sure to consult the owner's guide or instruction that came with your Arizer Extreme Q or V Tower for information on how to safely use the Arizer Potpourri Dish. If you want to continue to enjoy your Arizer Extreme Q or V Tower whip-style vaporizer to the fullest, you need to keep the vape whip completely clean. An important part of maintaining the vape whip is changing the vaporizer screens regularly, and Arizer Screen Pack gives you 4 arizer screens to keep your whip working great. Vaporizer whips are the devices that both hold the herbs and allow you to draw vapor. In a traditional 3-piece whip design, your vaping material is placed in a tube known as the wand. When it's time to vape, you insert the wand into the heating chamber to vaporize the materials. The vapor can then pass through the included tubing, so that you can draw. The job of the screen is to prevent particulates from your vaping material to come loose, fall out of the wand and enter your vapor and your mouth. The small particles get trapped, while the vapor passes through the small holes in the metal mesh. Why Replace a Vaporizer Screen? The job of a vape screen is to catch debris, so over time, particles will build up on the surface of the screen. Even if you clean the screen regularly, some debris and discoloration will persist. At some point, the debris can block the flow of vapor, reducing your ability to get a satisfying draw. It can also compromise the taste and purity of your vapor. How frequently you'll need to replace your screens will depend upon how much you vape and what you vape. People who use their vaporizers at least once per day, typically should replace the screens every 4 to 8 weeks. As a good rule of thumb, if vape screens look dirty even after cleaning them following the recommendations of the manufacturer or if you notice changes in the performance of your vape, you should change the screen. The Arizer Tuff Bowl is an optional accessory for both the Arizer Extreme Q Vaporizer and the Arizer V-Tower Vaporizer. This vape accessory is manufactured by Arizer and designed to replace the Cyclone Bowl, which is used to hold the herbs in both of the desktop vaporizers. The Tuff Bowl is a long, vertical tube constructed out of borosilicate glass surrounded by an impact resistant plastic sheath. Having glass on the inside of the bowl prevents impurities from entering the vapor path and compromising the taste of your vapor when you draw. The hard plastic outer covering provides protection for the bowl to decrease the risk of damage. Like the Cyclone Bowl, this replacement part is designed to ensure that dry herbs heat evenly and has a screen inside to capture fine particulates. 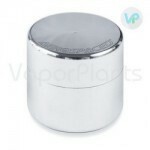 In addition, the top helps to keep the vaporizer from becoming hot to the touch during use. Who Needs the Tuff Bowl? The Cyclone Bowl is a high quality part; however, it can break because it is made of glass. Using the Tuff Bowl can help you to decrease the chances of this occurring. As a result, it's a great choice for anyone who moves their desktop vaporizer frequently in their homes or who takes it with them when they travel. If you have previously broken a Cyclone Bowl, you may want to invest in the Tuff Bowl. A heater cover is used to cover the heating element and is a common feature in desktop vaporizers as well as in some portable vaporizers. The heater cover serves two main purposes. First, it provides protection for the heating element, so that it is less likely to become damaged. This is highly beneficial as most heating elements are made from precious materials and are very costly to replace or repair. Secondly, the heater cover often improves the efficiency of the vaporizer. The Arizer Glass Heater Cover is a replacement part that is used to repair the Arizer Extreme-Q 4.0. Instructions for how to complete the replacement are typically included with the parts or with the original manufacturing information. This component is a genuine Arizer part and is identical to the part contained in the personal vaporizer when it was purchased. Please note: This part is only compatible with the 4.0 model of the Arizer Extreme-Q vaporizer. It will not fit properly in earlier models. If you have an earlier model and the heater cover has broken, please contact Arizer for assistance or contact us for help getting in touch with the manufacturer. Why Replace the Heater Cover? Often, heater covers are made out of glass or ceramic materials. This is beneficial because these materials do not contain synthetic additives, and they are highly heat resistant. Unfortunately, this also makes the parts fragile. If you notice even a small chip or a crack in your heater cover, it is a good idea to replace it as quickly as possible. Failing to do so could affect the performance of your vaporizer and lead to poor vapor production. The heater cover is not a part that requires routine replacement; you only need to purchase one in the event that it breaks. A hose or tube is used to connect the wand and the mouthpiece in a three-piece whip design. When vapor is produced inside of the wand and you draw through the mouthpiece, the vape tube guides the vapor out of the vaporizer and into your mouth. The Arizer Tubing is a replacement vape hose for the vape whip included with the Arizer Extreme Q or V Tower vaporizer. Vaporizer tubing is an essential part for your vape, and you'll want to replace it regularly to continue to enjoy its full benefits. This vape tube is made from medical grade materials, so it's nontoxic and won't contaminate your vapor. The length of the tube is 3 feet, giving you plenty of length. A vape hose is designed to be durable but it can become bent and misshapen with frequent use. This can make it more difficult for vapor to pass freely through the tube and into the mouthpiece. Replacing it regularly will help to prevent this problem. Some people like to purchase several lengths of tubing at one time in order to stock up. It is also common to purchase extra vape tubes when you initially buy a vaporizer. How often you'll need to replace the tubing will depend on how often you vape and what you are vaping. Generally, you should plan to replace the vaporizer tube every 3 to 4 months. If you notice a decrease in vapor flow before then, you should change the vape hose sooner. Debris may build up inside the whip tubing where it connects to the wand. It can be difficult to clean the inside of vape tubing, so it's necessary to replace it if you notice discoloration inside of the tube. Experts recommend that you change your vape bag or balloon on a monthly basis if you use your balloon regularly. Doing so helps to ensure that your vapor stays free of contaminants and that you don't experience leaks that can end up wasting your vaping materials. The Arizer Balloons gives you a total of 4 bags for the Arizer Extreme Q vaporizer. The vapor bag design is the same as that of the vape bags included with the desktop vaporizer. The set also includes 4 of the clamps needed for filling. Two contaminant-free glass mouthpieces are also included with the kit. One of the most innovative things about the Arizer Extreme Q and Arizer V-Tower vaporizers is that both of these desktop vaporizers can be used as bag device with the right attachment. The Arizer Mini Whip gives you everything that you need to fill up bags directly from your Arizer vape. The Arizer Mini Whip consists of three parts. First is the glass elbow adapter, which fits inside of the Cyclone Bowl portion of the Arizer vaporizer. The elbow adapter is constructed out of glass to promote clean, impurity-free vapor flow. A domed metal screen is included to filter out any impurities. The final portion is a 3-inch length of silicone tubing. The tubing gets attached to the glass elbow on one end and the mouthpiece of the collection bag on the other. It's important to note that this mini whip kit is only compatible with the New Frosted Glass Mouthpiece for Balloons and the Original Glass Mouthpiece for Balloons. Who Needs the Arizer Mini Whip? You may choose purchase to the Arizer Mini Whip for a number of reasons. If you have misplaced your original mini whip or both the tubing and the glass adapter are showing signs of wear and tear, replacing it with this kit is a cost effective solution. Some people like to have a spare mini whip on hand for emergencies or so that they have an extra to use when cleaning their factory-direct set. VaporPlants.com also carries the glass elbow attachment and metal screen as an individual part. If your vape tubing is good condition, you may wish to purchase just the elbow set; however, since you need to replace tubing periodically, the complete kit is still a smart investment. One of the most innovative features of the Arizer Extreme Q desktop vaporizer is its remote control functionality, so you don't want to be without this accessory. The Arizer Extreme Q Remote Control is an exact replacement for the remote control included with the original set of Arizer vape accessories that comes with the desktop vape. The necessary battery for operation is preinstalled in the remote control for your convenience. You can unbox this remote and use it right away with no need to code or program it. The Arizer Extreme Q Remote Control makes it possible to perform nearly all of the functions of the desktop vaporizer. The red buttons at the top control the power and the audio, while the blue buttons adjust the fan speed and turn the light on and off. The green buttons make it possible to switch between the different draw method options, and the buttons at the bottom are for setting the temperature. Who Needs the Arizer Extreme Q Remote Control? Typically, the Arizer Extreme Q Remote Control is purchased when the original remote included with the Extreme breaks or is misplaced. Some people like to purchase a spare remote control to have on hand in case of emergency or like to keep two in different locations in a room for easy access. What Is a Vaporizer Whip? The Arizer 3 ft Whip is a complete three-piece whip kit made for the Arizer Extreme q and Arizer V-Tower Vaporizer. The vape whip is constructed to the same level of quality that is found in the Arizer parts received with your initial purchase. A whip is a device that is used to draw vapor out of a desktop vaporizer. With some whip-style models, the vape whip is the only draw method available, while other desktop vaporizers allow you to use other types of attachments or vape bags along with a whip. The three-piece whip is the most common style of vape whip on the market today. The first component of this type of vaporizer whip is the wand. This long thin rod holds vaping materials and is inserted inside of the heating chamber of the vaporizer. On the other end of the whip is the vape mouthpiece, which is placed to the lips when it's time to draw. The speed and force of the draw through the mouthpiece affects the vapor production from the desktop vape. The final component of a three-piece vapor whip is the vape tube, which connects the mouthpiece and wand. The Arizer 3 ft Whip features the absolute best materials available for whip design. The mouthpiece and the wand are fabricated out of a breakage-resistant glass. Most experts recommend glass vaporizer parts because they are free of chemical additives and therefore will not contaminate vapor, dry herbs or other vaping materials. The vape tube featured in this whip design is constructed out of medical grade materials, ensuring that it is nontoxic. The tubing is 3 feet long to give you enough length to sit comfortably away from the desktop vaporizer. The Arizer Whip Kit is a complete three-piece whip kit made for the Arizer Extreme Q Vaporizer and the Arizer V-Tower. The vape whip is constructed to the same level of quality that is found in the Arizer parts received with your initial purchase. With the Arizer Whip Kit, you get a number of additional Arizer parts and essential accessories for one remarkably low price. The kit includes a stir tool that you can use to ensure efficient vaporization and assist with loading. A new glass elbow adapter and a replacement screen are also provided. You even get one a spare borosilicate glass Cyclone bowl to have on hand in case the one in your Arizer Extreme Q or Arizer V-Tower Vaporizer ever breaks. The Arizer Whip Kit features the absolute best materials available for vaporizer whip design. The mouthpiece and the wand are fabricated out of a breakage-resistant glass. Most experts recommend glass parts because they are free of chemical additives and therefore will not contaminate vapor, dry herbs or other vaping materials. The vape tube featured in this whip design is constructed out of medical grade materials, ensuring that it is nontoxic. The tubing is 3 feet long to give you enough length to sit comfortably away from the desktop vaporizer. The Arizer Extreme Q / V-Tower Power Cord is a replacement cord that works with the Extreme Q and V-Tower vaporizer. It is identical to the original Arizer parts and works with 110/220 volt outlets. Both the component that plugs into the desktop vaporizer and the wall plug are included with the cord. The cord is certified as meeting or exceeding UL and International Safety Standards to ensure safe operation. A high quality power cord is of the utmost importance to the safe operation of any desktop vaporizer. If a power cord becomes kinked or you can see wear and tear along its length, you should replace it immediately to avoid electric shocks, accidental fires and poor performance from your vaporizer. All questions answered - Review by Marci B.
I felt a little weird about calling to get help with a vaporizer, but I felt really comfortable after speaking with your rep. All of the questions I had were answered and the entire ordering process went over really smoothly. Great parts - Review by Jeffrey D.
This site is definitely the best one from which to buy vape parts when you need them fast. Super fast service - Review by Cheryl R.
I really appreciate the super fast service that VaporPlants has given me. It was a gift that I ordered for a friend to enjoy and I got it last minute. It still came in only a few days, which was way before when I expected.